The Horizontal Supervision Agreement was signed by the Tax Department and Van der Lee Seafish on 2 February 2012. 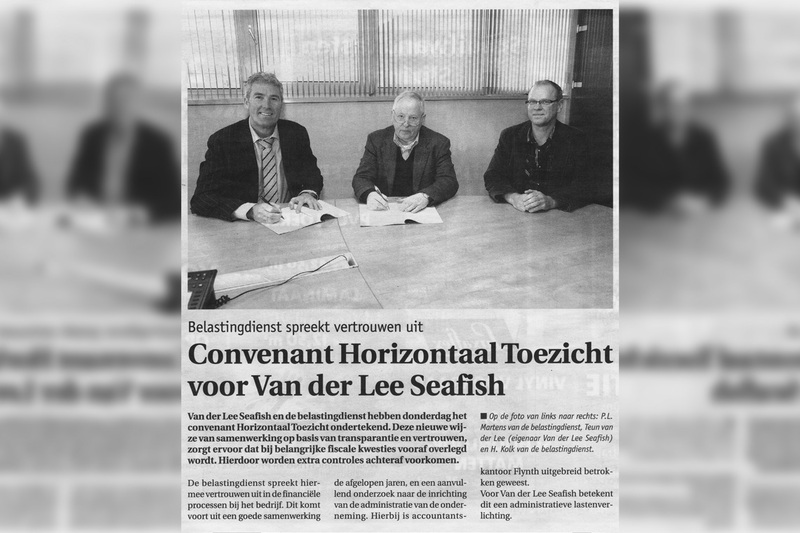 This agreement involves a new way of cooperation between the Tax Department on the one hand and Van der Lee Seafish on the other. A cooperation based on transparency and trust. A collaboration that emanates from their prior consultation if important tax issues, seem to be imminent. A collaboration that prevents a variety of additional verification, later. The Tax Department therefore expresses its confidence in the financial processes conducted at Van der Lee Seafish BV. It arrives at this conclusion based on the long-standing excellent collaboration and additional research into the administrative structure and organisation of the Company research in which the accounting firm Flynth (formerly GIBO) has been extensively involved. For Van der Lee Seafish BV, this represents a significant alleviation of the administrative burden and optimum use of the expertise of the client coordinator at the Tax Department. The Tax Department can now shift its priorities slightly as a consequence.